Most of us know about the dangers of distracted driving; it’s often drilled into our head at an early age, and then reinforced during driver’s education (anyone remember Red Asphalt?). As teens, we were told not to eat or smoke while driving; not to apply makeup or chat up passengers; and by all means, keep that radio down! While it’s still important to heed those warnings, they seem almost quaint when compared to the technology that’s taking our eyes off the road now; and it’s not just teens. Today, people of all ages are using—and over relying—on GPS to get around. As a result, incidents, accidents, and in some cases death, are on the rise due to GPS. Texting while driving is considered one of the leading causes of traffic accidents, rivaling even drunk driving. But even if you don’t text and drive, you may be guilty of programming your GPS while on the road—and that can be just as dangerous. And while this may seem obvious, there are other ways that a GPS may distract us. 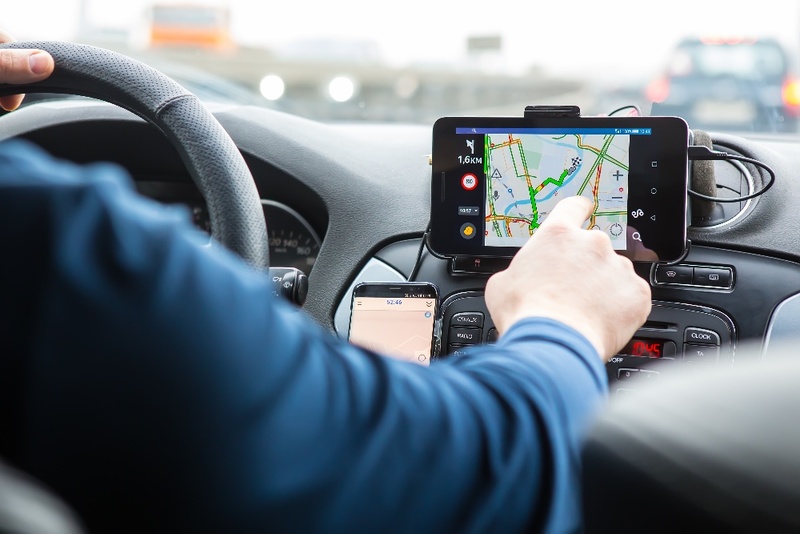 In a recent study, the Network of Employers for Traffic Safety (NETS) found that GPS users often mute their device which increases their distraction level; without the voice commands, drivers spent more time looking at the screen instead of the road. Failure to turn the radio down can also contribute to this; if the driver can’t hear the GPS voice instruction over Life is a Highway, they’re bound to watch the screen instead (to combat this, many new automobiles with a built-in GPS now automatically mute the radio to ensure commands are heard). We like to think our technology is all smart—after all, they are called smartphones. But GPS devices aren’t perfect; satellite communication errors and outdated or inaccurate maps can send drivers in the wrong direction, or steer them onto unsafe terrain or into other hazards, such as artificial lakes or train tracks (we’ll cover these stories in an upcoming post). Being overly confident in a GPS can also cause people to take instructions too literally: a GPS warning a driver to “make a legal U-turn when possible" could send someone veering into oncoming traffic if they’re not paying attention. That’s just what happened this past April in Titusville, Florida. A family of four visiting the Sunshine State from England was traveling on a state road when their rental car’s GPS instructed them to make a U-turn at an upcoming intersection, most likely because a crash had been blocking the road ahead earlier that day. The driver obliged, making the U-turn and putting the car directly into the path of another vehicle. The result was a violent impact that tragically killed the family. Until a law outlaws them (unlikely) or self-driving vehicles become the norm (it’s coming), GPS devices will continue to be used by motorists. With that in mind, here are a eight tips for safe GPS operation. If you’re not using a built-in GPS, ensure your handheld GPS or smartphone is properly mounted so you don’t have to worry about it falling while driving. Placing it at eye level will also help keep your attention closer to the road when you do refer to the screen. 2. Program your destination before you go. It’s easy to hit the road and then start programming your GPS, especially if you’re in a hurry. But don’t do it. Take the extra minute or two to program in your destination beforehand and be sure you’ve got the address correct so you’re not changing directions while en route. 3. Familiarize yourself with the route. It’s best to take a look at the path the app has mapped out for you before you go. This way, you’ll have a general idea of where it’s taking you and your eyes won’t be glued to the screen while driving. Voice commands help to keep your eyes on the road, not the display, and often provide more advance notice of turns and lane changes than what you’ll find on the screen. Plus, be sure to keep the radio low, or better yet off, so you don’t miss a command or misunderstand one. 5. Pull over to course-correct. If you have to change your directions while driving, pull over to reprogram your GPS when you can safely do so. Have a passenger traveling with you? Put them in charge of the directions so you can focus on the road. Some GPS devices will automatically make updates; others, when an update is available, will ask if you’d like to accept them. If you’re busy and using your phone at the time, it’s tempting to ignore the update. But a GPS update could save your life, so always make them when they’re available. 8. Hang on to that map. As tempting as it is to throw it away, keep a map in your glove compartment. You never know when your technology may fail or your battery will die, leaving you lost and in unfamiliar territory. GPS can be a great thing. When the directions are accurate, it can save us time; it can save us from arguments with a partner over whether to make a left or a right; and it can even save lives by being used as a tracking device. But like anything, common sense must be used, and sometimes that’s lacking these days. If you’ve been injured in an accident caused by driver inattention, our Spring Hill-area personal injury attorney services can help to ensure that you receive the compensation you deserve. Contact Lowman Law Firm today for your free consultation.